This week’s loss was a small one, but a loss is a loss, right? My ankles are a bit puffy in this picture because we took the picture after we got home from our road trip. I’d been in the car for a little over 4 hours, and you know being stationary + salty food = cankles. I’m not thrilled that I’m developing a turkey wattle under my chin–how apropos since it’s November and all. But I’m starting to see a LOT of loose skin all over (arms, legs) that needs tightening. Time to start lifting weights I suppose. Now how to fit it into my schedule is the question. I also need a haircut in a bad way, but I’m terrified of getting it cut because I’m losing hair by the handful and have been for the past month now. I hope this hair loss slows down and stops soon because I already had thinning hair to start with and this is NOT HELPING. I wasn’t surprised that this one was a little over a pound. This week saw TOM all week long, and I generally don’t lose too much weight when my period is happening. Stupid hormones. But this is the pattern that I have noticed over the past 4 months: weight loss slows down around this time, and then picks right back up, so I’m not discouraged by what popped up on the scale this morning when I weighed in. 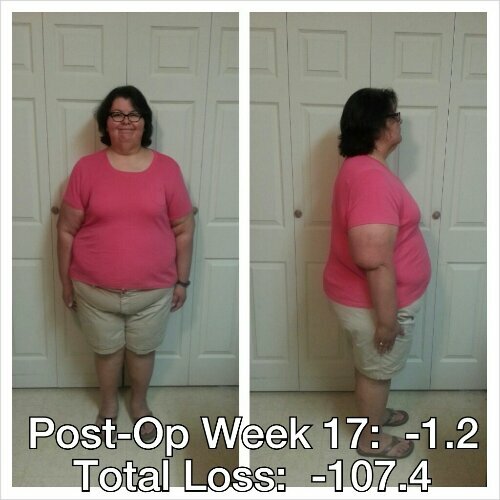 This week is a new week, and I have a feeling next week’s weigh-in will be an even better one. For now, I’m going to stick with keeping protein at 80 grams or better since this seems to be working really well for me. I’m also going to stick to the 800-900 calorie range since that seems to work well for me right now too. I do need to increase my activity though, because I’m noticing per my Fitbit app that I’m burning fewer calories each day, which tells me that I need to work harder to burn the calories I need to burn in order to lose the remaining weight I want to lose. This is happening because I’m now lighter than I’ve ever been as an adult, and as I lose more weight, I will have to work harder to lose the excess weight I’m still carrying around as my metabolism adjusts. I’m slowly chipping away at my next weight loss goal, which is to lose 20 (well, now 19) pounds by January 1. This will put me at nearly -130 pounds since my consult in May, which will be a good thing to show my surgeon at my 6-month follow up on January 2. I’d like to be at or near my surgeon’s goal by my birthday in March. After my experience with the 1-Mile Mosey on Saturday, I decided that I had really enjoyed that short jaunt, and that I wanted to do it again. So I did a search for other fun runs taking place in my area and found a few that my schedule might allow me to participate in. I chose the Gobble Hobble, which is a race sponsored by a Rotary Club in a neighboring city that benefits victims of violent crimes in that city. 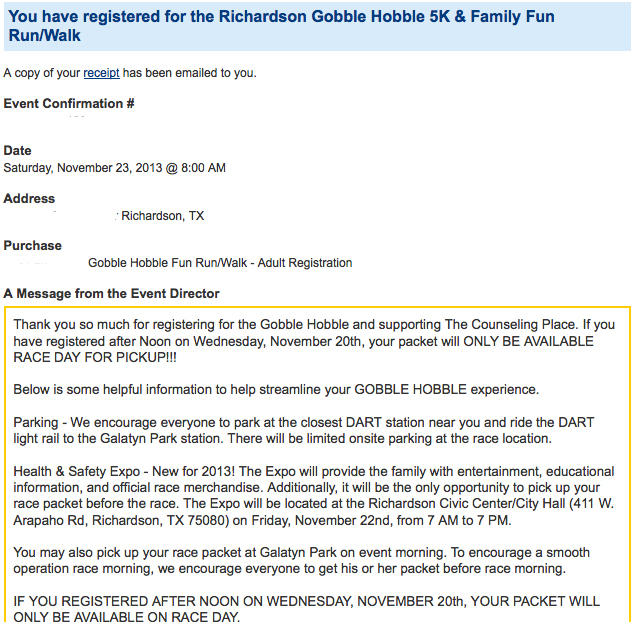 I went ahead and registered for it. And now I’m thinking about registering for another one in December! Who am I? What is going on here? I am pretty sure that if you had asked me a year ago if I’d do a fun run, I’d tell you that no way in hell did those two words did not belong together and that the only reason I’d run is if I were chased. Of course, a year ago, I couldn’t have run even if I’d been chased! Now, I want to do these short races to challenge myself. I am a highly competitive person, and I find that competing against myself is highly satisfying. While I was walking/running (or at least what I call running, ha!) yesterday, I kept thinking the next time I do this I want to get under a 20 minute mile, I wonder if I can do it? I don’t care about winning a prize or a trophy; I care about beating my own times. The athlete that’s buried under the melting fat is fighting hard to emerge, and I’m doing what I can to encourage her to keep fighting her way out. Every. Damn. Day. I think participating in these short run/walks is a good and healthy way to encourage that and to stoke the competitive fire that I know burns inside me. I’ve thought about another one I want to do in December right after school lets out for the Christmas holiday, but I need to think about it because of the temps at that time of year. I get hives when I’m in the cold for too long, and in my mind, the time outside is not worth the itchiness and misery that ensues when I break out. Perhaps I’ll just head to the indoor walking track at the rec center to do a fun run on my own in December. Eventually, I’d like to work up to doing a 5K each month of the year, but I know that right now I’m simply not ready for that distance. By March, I think I’ll be ready, but right now I can’t go 3.1 miles in one fell swoop. Today’s eating was not terrible, given that we were on the road for a good chunk of the day. I managed to get in 88 grams of protein, which I really needed to repair my sore muscles from yesterday’s run. Eating on the road is tough because there are not terribly many good choices, but I made the best of it and stayed under my calorie goal for the day. This week I’m eating out of my freezer since we didn’t get home in time for me to cook anything for the week. Thankfully before we left, I’d cooked and frozen plenty of things so I will have protein-packed meals all week long. 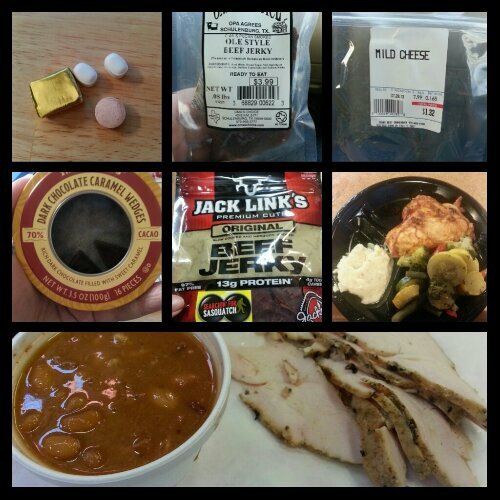 Today’s food choices, from upper right: a slice of mild cheddar cheese; baked chicken breast with mashed potatoes and mixed veggies; Rudy’s smoked turkey and pinto beans; Trader Joe’s chocolate caramel wedges; multivitamin and calcium supplements x2, iron supplement; Oma’s choice beef jerky; Jack Links beef jerky. This entry was posted in challenges, daily bites, eating, exercise, goals, la guerra, NSV's, post-op, progreso, success, the sleeve, vsg, weight loss surgery and tagged aspiring runner, exercise, goals, identity crisis, little celebrations, NSVs, planning for success, post-op eating, post-op life, runner wannabe, running, self-image, sleeve gastrectomy, VSG, vsg realness, WLS, workin' on my fitness. Bookmark the permalink.